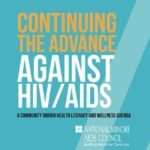 Washington, DC – To mark World AIDS Day, the National Minority AIDS Council (NMAC) is pound to announce the release of its new report, Continuing the Advance against HIV/AIDS: A Community Driven Health Literacy and Wellness Agenda. The document, which was developed in large part through the discussions that occurred during its two-day Health Literacy and Treatment Education Think Tank held last year, as well as the work groups that were subsequently formed with Think Tank participants. The Agenda released today provides a rationale and recommendations to support stakeholders in recognizing and promoting strong evidence-based health literacy programming among people living with HIV, viewing it as an essential component to and strategy for ending the HIV epidemic. The recommendations made herein are the result of significant community consultation, a review of the available literature and the previously mentioned Think Tank and additional targeted expert consultation.